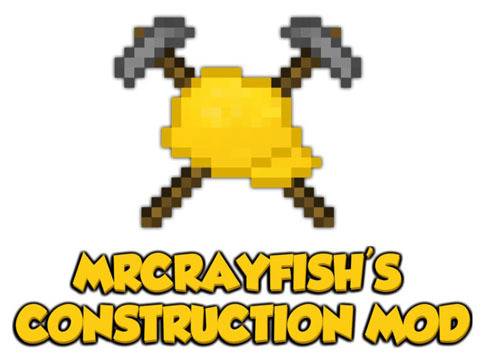 In MrCrayfish’s Construction Mod, there are 4 main items/blocks which are involved of the creation of a structure. The Blueprint: A Blueprint is the key to making any structure as it holds the plans on it. I decided this would be a great thing to implement as I wanted to get that real life feel of when constructing a building. The Blueprint can hold any plans you want. (Read Custom Buildings). Planning Table: You can can’t fly a plane without training, same with building, you can’t build a structure without a plan. This is where the Planning Table comes in. The Planning Table draws the designs onto the Blueprint at the cost of a certain amount of Ink. The bigger the structure, the more Ink that is required. Construction Block: I needed a way to translate the plans from the Blueprint to tell me the materials needed. The Construction Block can do that. It will display every required block/item needed to generate the structure. Once you have them, you can proceed to construct your building by placing the required blocks/items into the slots provided. Press the start button to begin the construction process. The Hammer: This is where I have been inspired from Age of Empires (A.O.E.). Once you have the required materials placed into the Construction Block and you have pressed the Start button, you will need to get a Hammer. You begin the construction process by hitting the Hammer on the Construction Block. Now this is where it gets very unique! Every 10 hits on the Construction Block, it will generate 1 layer starting from the bottom until you get to the top. To install the Building Packs, load you game up at least once and then drag the content of the zip file (the files should be text files) into the “buildings” folder located in your .minecraft folder.